Organizers say federal policies to seperate undocumented parents from their children is appalling. 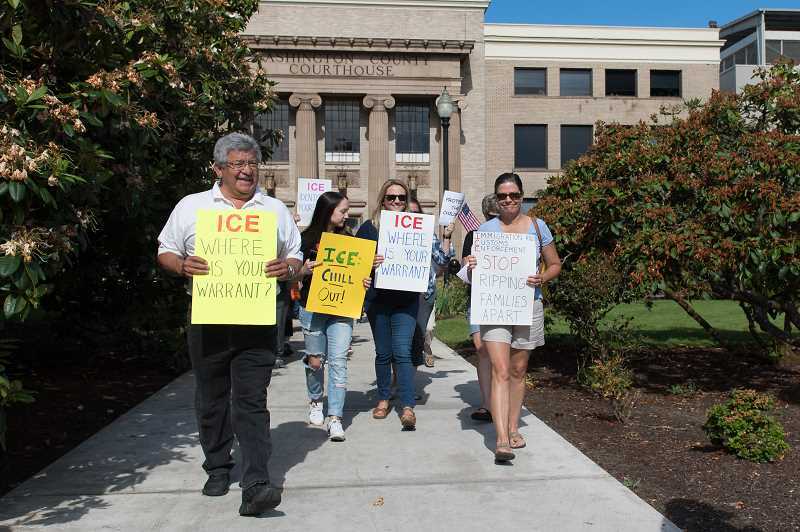 A crowd of protestors and religious leaders outside the Washington County courthouse on Monday morning called for an end to the federal government's "zero tolerance" policy toward illegal immigration. For months, border patrol and immigration officials have clamped down on undocumented immigrants crossing the U.S.-Mexican border. The policy includes prosecuting anyone caught illegally crossing into the United States, even if they petition for asylum, and separating undocumented children traveling with their parents, housing them in separate detention centers without contact. 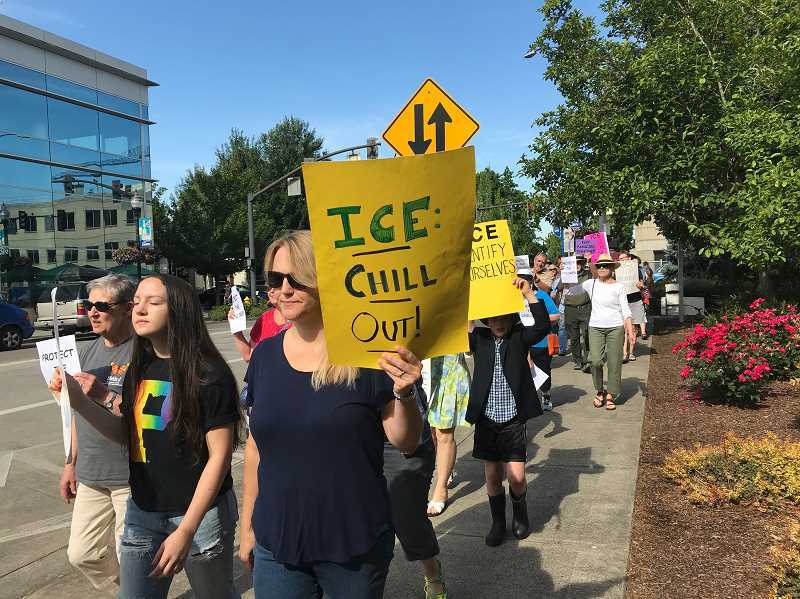 Monday's gathering in Hillsboro was organized by the Washington County cohort of Interfaith Movement for Immigrant Justice, made up of local church congregations. The group formed last year in response to federal immigration policies enacted by President Donald Trump's administration. "Separating children from their families is not just problematic," said the Rev. Laurie Larson Cesar, pastor at Spirit of Grace church in Beaverton. "It is a form of torture that may cause lasting trauma to individuals' psychological and emotional well-being. This practice is morally reprehensible. As people of faith we cannot and will not stay silent in the face of such cruelty and injustice." U.S. Attorney General Jeff Sessions instituted the policy in April, saying undocumented immigrants were using children as a way to get around deportation. "If you are smuggling a child, then we will prosecute you and that child will be separated from you as required by law," Sessions said in April. "If you don't like that, then don't smuggle children over our border." The policy has proven to be extremely controversial, with opponents calling for the policy to be abolished. "Think about your children and grandchildren being taken away from you at 5 years old, taken from the only person they know in a foreign country, in a language they may not understand," organizer Mary Davidson told protestors on Monday. "It's terrifying. They will live with post-traumatic stress for the rest of their lives." The policy has so far separated about 2,000 children from their parents, according to the U.S. Department of Homeland Security. "Having children does not give you immunity from arrest and prosecution," Sessions said last week. The policy has local impacts. A group of 123 undocumented immigrants arrested as part of the crackdown are being held at the Sheridan Federal Correctional Institution, southwest of McMinnville. "Their families did not know where they were or if they were even alive," Davidson said. "We're here today to say no more. We need to stop separating children from their families. It is not right." During Monday's demonstration, organizers cited the harmful effects of the policy, including the death of Marco Antonio Muñoz, a 39-year-old Honduran father separated from his wife and young child in May after they crossed the border seeking asylum. Muñoz suffered a mental breakdown in custody and committed suicide in a Texas detention center, according to The Washington Post. "These are human beings," said Tigard resident Marilyn Taylor. "They treat them worse than dogs getting ready to be offed at the pound. This is not humane. This is America, this isn't North Korea. We aren't the Viet Cong." Protestor Jose Jaime, of Hillsboro, said many Latino families are afraid to speak out, fearing retaliation, but said it is important to speak up for what he believes in. "The White House claims to be Christian and we are claiming to be Christian, and yet we're on opposite sides? Where is Christ in this?" Jaime asked. "Christ is with the one suffering from hunger, the one who doesn't have a place to live, the one who is incarcerated. Christ is with the suffering people, not at the White House." Earlier this month, Sessions defended the policy, saying criticism from religious leaders was unfounded. Sessions quoted the Apostle Paul, who wrote in Romans 13 that people should "obey the laws of the government because God has ordained the government for his purposes." Protestors said Sessions missed the most important verse from that passage. "He didn't read the whole thing," said protestor Barbara Snyder on Monday. "It goes on to say that we should love each other and love our neighbors as ourselves. That's the law above every law." Organizers say the policy can be changed if enough people speak out. They hope demonstrations such as Monday's vigil will spark others to speak out about injustice. "People sit at home and agree that we should do something, but they need to get out here so Congress will get off their duff and stop the petty arguments," said co-organizer Mary Ryan-Hotchkiss. The protestors planned to attend a similar vigil outside the Sheridan detention center on Monday evening.